Police arrested two people who allegedly burglarized a Vietnam veteran while he was in the hospital. A man and a woman were caught on camera burglarizing the home of a Vietnam veteran while he was in the hospital, according to Massachusetts authorities. 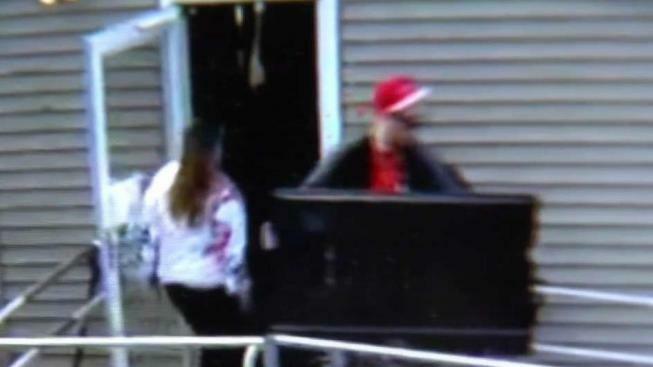 Investigators say 35-year-old Joseph Migliaccio and 31-year-old Sarah Hampton, both of Sudbury, appeared on home security video taking a TV out of Gene Rano's home on Lakeshore Drive in Marlborough this weekend. Nick Rano says his father is fighting for his life at Massachusetts General Hospital. He was severely injured last week while burning brush in his yard, and he suffered a stroke a couple years ago, leaving him in a wheelchair. "As soon as I walked in, you could just tell the place was ransacked," he said. Rano believes the suspects knew his father, realized he was hurt and preyed on him when he was vulnerable in the hospital. Migliaccio, however, denies that it's him on the surveillance footage. "I don't know what you're seeing, but his son doesn't know the relationship that me and Geno and Sarah have," he said. Migliaccio and Hampton are facing charges of breaking and entering in the daytime and larceny of a disabled person. They were released from jail on bond.